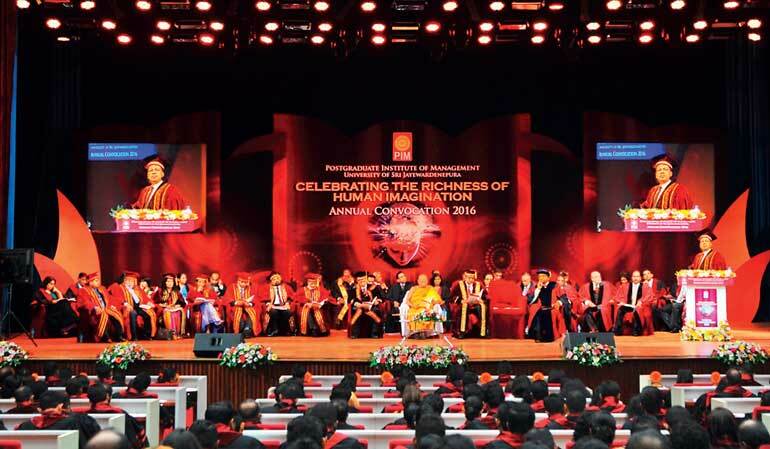 I led the organising team for the graduation of 452 extraordinary managers at PIM’s largest convocation ever. That was a celebration of human imagination. We picked the theme as ‘Celebrating the Richness of Human Imagination’. A convocation marks the end of one era and the beginning of another of learning and application. Today’s column is a reflection of that transition. As Aristotle said, the roots of education are bitter but the fruits are sweet. The convocation day was a time of tasting that sweetness. A good Master’s program should have high quality and relevance. That’s what we at PIM are continuously striving for. In the dynamically changing era that we are going through, human imagination is the cutting-edge factor for growth and prosperity. Every product that we use or every service that we experience was someone’s imagination some time ago. Imagination leads to innovation which in turn leads to implementation. All those who graduated should be imagining a better future. We produce thought leaders to the nation. PIM has been at the forefront in breeding such leaders with character and competence. They are equipped with cutting-edge knowledge and the complementary skills needed to perform in both the private and public sectors alike. In producing them with clarity and commitment, PIM has always been a centre of excellence in management education with its wings spreading beyond Sri Lanka. Excellence is all about being exceptionally good. When applied to enterprises, it involves exceptional achievements in a consistent manner. That’s why PIM is proud of being a self-financed, semi-autonomous public entity. Prof. Chitru S. Fernando, Professor of Finance, Price College of Business, University of Oklahoma, US was the keynote speaker. He spoke on the theme ‘Imagination to innovation: Insights for Initiatives’. We were glad to invite a son of our soil doing very well in the US having hailed as one of the brilliant Sri Lankan academics in the field of finance in the US. He is the Rainbolt Chair in Finance, Professor of Finance, Director of the Division of Finance and Director of the Center for Financial Studies at the Price College of Business, University of Oklahoma, US. He has been a Research Fellow at the University of Pennsylvania of the Wharton School Financial Institutions Center since 1996. He is the Founding Director of the Price College Energy Institute and also served as the Energy Institute’s Research Director. He has held faculty appointments at three other US universities: the University of Michigan’s Ross School of Business, Southern Methodist University’s Cox School of Business and Tulane University’s Freeman School of Business. He has also served on the faculty of the Carnegie Mellon Tepper School of Business Program for Executives as a Senior Fellow at the Wharton Risk and Decision Processes Center and as a Consultant to the World Bank. Professor Fernando’s areas of expertise are in corporate finance, corporate risk management, energy finance and liquidity risk in financial markets. He has lectured on corporate finance, international finance, corporate risk management and energy finance topics to executives in the US, Europe, Asia and Latin America. Professor Fernando has been cited for his teaching in three Business Week surveys of business schools. He received a Ph.D. in Finance from the Wharton School of the University of Pennsylvania; M.A. in Applied Economics from the University of Pennsylvania; M.S. in Management from the Sloan School of Management, Massachusetts Institute of Technology; M.S. in Engineering (Technology and Policy) from the Department of Mechanical Engineering, Massachusetts Institute of Technology; and a B.Sc. in Mechanical Engineering with First Class Honors from the University of Ceylon. I felt that Prof. Chitru’s speech was relatively brief but brilliant. His main focus was to highlight how innovation can assist in sustainability initiatives. I thought of sharing some extracts from his speech. “The manifestation of an imagination that is set on fire is creativity and the hallmarks of creativity include ‘out-of-the-box’ thinking; asking ‘why not’ instead of ‘why’; taking risks; persistence when you know you’re on the right path. And the outcome of creativity is innovation, resulting in products, processes, systems, and in general, solutions to critical problems that benefit not only the architect of the innovation but also society at large. “We can draw much inspiration from the creativity of our Sri Lankan ancestors. We proudly take foreign visitors to see their works in Anuradhapura, Polonnaruwa, Sigiriya and other ancient cities. We can think of our tea industry, still the backbone of our export economy, started by a creative Scotsman, James Taylor, in 1867. This creativity is still manifested 150 years later in individuals like Merrill Fernando whose ingenuity stemmed from equating fine tea with fine wine and understanding the trade-off between quality and quantity. Today, Dilmah single-estate teas are a hallmark of the finest hotels and airlines in the world. “We can look back to the 1944 Free Education Act, which sparked a profound transformation of Sri Lankan society, breaking down class barriers and creating a more equal society. To paraphrase Nelson Mandela (2003), ‘Education is the most powerful weapon we can use to change the world.’ Dr. C.W.W. Kannangara understood the value of educating the populace nearly 60 years prior to Mandela’s speech. “We can reflect on the opening up of our economy in the late 1970s, ending a protracted period of economic stagnation, and the accelerated Mahaveli development program where a project planned to be undertaken in over 20 years was completed in around six. An immense transformation of the economy, the countryside, and agriculture took place, which along with the introduction of the open economy changed the attitudes of people to bring Sri Lanka into the modern age. “We can also think of many international examples of creativity that have had a global impact but I will mention only the case of Grameen Bank in Bangladesh, and its founder, Nobel laureate Professor Muhammad Yunus. I know that the principles of microfinance that Professor Yunus introduced have been widely adopted in Sri Lanka, as well as around the world including the United States, through Grameen America. I mention Grameen to illustrate the point that local problems call for local solutions. But what Professor Yunus teaches us is that local solutions can be informed by global knowledge and can, in time, become global solutions to acute problems like rural poverty that he was trying to address. “Managers are also called upon to address other important contemporary issues. I will mention just two – corporate social responsibility and corporate governance. The Nobel Laureate Professor Milton Friedman was famously quoted (or misquoted) as saying that the social responsibility of a business is to increase its profits. But this was just the headline of a long newspaper article that was published in 1970 based on an interview with Professor Friedman. What Friedman did say was that in a free enterprise, private property system a corporate executive has direct responsibility to conduct the firm’s business in accordance with the desires of shareholders, which generally will be to make as much money as possible while conforming to the basic rules of the society, both those embodied in law and those embodied in ethical custom. Even if the Government may not have well-developed laws and regulations pertaining to the social and environmental footprint of companies, it’s the responsibility of business executives to respect ethical custom in society. “What I can tell you based on my own research is that society in general and investors in particular amply reward companies that run their business safely, ethically and with minimal societal and environmental impact. In other words, corporate social responsibility practiced correctly is consistent with shareholder interests, not in conflict with it. Corporate governance occurs in a similar manner. The oversight of companies occurs first and foremost through the representatives of the shareholders, i.e., the board of directors, as well as through large investors and market intermediaries. Corporate oversight also occurs through various Government agencies, and laws and regulations. Again, corporate finance research shows that well-governed companies are richly rewarded by investors. “I hope that some of you will consider moving into a full-time or part-time teaching career. There’s nothing more satisfying to me than setting imaginations alight in my students, then stepping back and seeing what happens. My chemistry teacher at S. Thomas’ College liked to compare the propagation of knowledge using the example of someone using the flame of a coconut oil lamp to light the lamp of another. Doing so does not diminish the flame of the lamp lighter, and now with two lamps burning, there’s more light so everyone can see better. I think you will agree with me that this world needs a lot more light and a lot less heat. Convocation for any graduate is the commencement of a new journey. The time to focus on applications in delivering results has come. I earnestly hope that the 452 private sector managers and the public sector administrators who graduated will contribute their utmost towards the betterment of themselves, their respective organisations and the nation at large.